People everywhere were stunned to read and see the effects of Hurricane Sandy on the Connecticut shoreline, New York and New Jersey. With the devastation occurring in an area so close to my home, I had the opportunity to donate time and energy as well as make a financial donation. 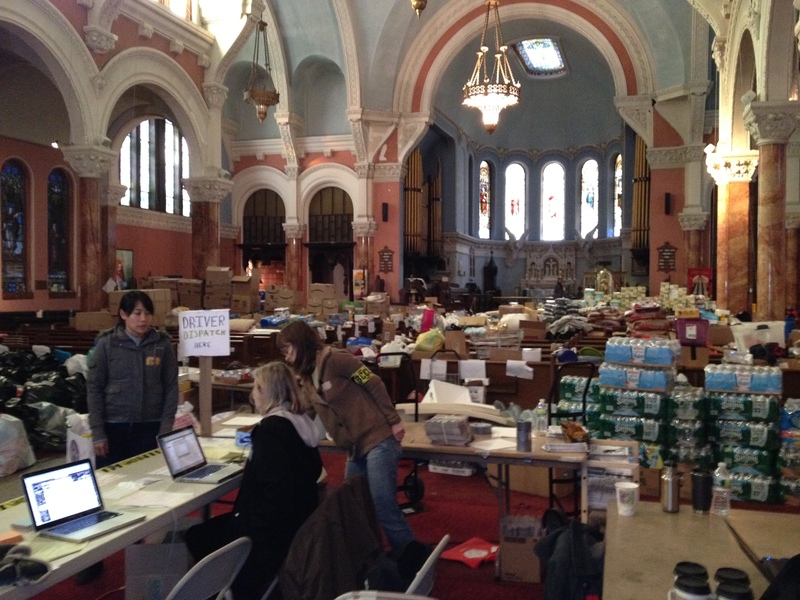 On November 17, I joined 4 other members of Occupy Hartford in a drive to New York to deliver supplies and labor aid to Occupy Sandy. I was reminded throughout the experience of our connectedness to each other, the goodness by which we are surrounded and the real possibility of touching lives in positive, intimate and on-going ways. Before making this trip, I arranged to meet some Occupiers from Maine to give them donations collected by Occupy Hartford. The day was marked by acts of kindness, acts of determination and what some might refer to as “good luck” all along the way. Our first stop was at the home of friends who, while unable to make the trip, had supplies to send to the distribution center. The car was full, too full to accommodate their entire offering, unless of course, one of our passengers offered to hold a box of supplies on her lap for the entire trip. Done! The next stop was the church in Brooklyn. After arriving at St. Luke and St. Matthew Church in Brooklyn, I was overwhelmed to see so many critical supplies ready for distribution and knew many of them may well have arrived on one of those supply runs. Circularity making an unpredicted appearance! Walking into the church was an emotional moment. The sense of order and calm amid the chaos of social need was intense. Pews extending the length of this large church are each labeled with a donation category so volunteers can easily sort through donations and put them in the right place. A vehicle dispatch table is set up to send volunteers with cars to specific areas needing help, whether supplies or clean up labor. Occupy Sandy’s use of the balcony in the church is for general dispatch – taking calls, connecting needs with solutions. In the basement level is the kitchen. Volunteers going to sites without power are offered meal bags. The 2 peanut butter sandwiches, snacks, pudding, fresh fruit and juice box I took with me when we left the church was a reminder of how the basics are the most precious in time of need. We were asked to go to Breezy Point in Queens to help with the clean up effort. Arriving at the fire station, we were given masks, work gloves and boots. Again I had to wonder if some of the items we were using that day had passed through the hands of anyone at home. The sense of community was apparent even in the midst of the material community devastation – still without power, houses twisted to unimaginable shapes, yards and cars covered in layers of sand. We arrived at a house completely flooded during the storm and joined in demolition efforts with others already there, some from upstate NY [including] two retired firefighters who had flown here from CA to help. We knocked down walls, tore up floors, hauled debris and shared our stories as we worked. Maura, the owner of the house, was grateful for the help and took everyone’s name and email address. She has every intention of having us back for a reunion in a rebuilt home next Spring. There’s that circularity again – house built, house destroyed, house rebuilt. Part of our plan was to drive to Rockaway with some much needed money. We left one kind of neighborhood for another, very different in nature. Small shoreline houses were replaced by larger apartment complexes. Beach proximity was replaced by city streets. But the scene was the same in the most important respects – damaged and destroyed properties, sand covered yards, cars covered with sand and mud obviously stranded since the storm. Also apparent were the same crowds of people with brooms and shovels in hand, working to clear debris. We found our Occupy Sandy destination and met Kara from Occupy Maine, one of the drivers who had come through to pick up supplies a week or so earlier. We’d never met before but were connected through our mutual goals. Circularity. Money delivered to its intended place, it was time to head home. During the day I took pictures when possible, not as a tourist but in hopes of visually sharing the experience that might get more people involved. It was obvious that the help will be needed for a long time. So much work to do but also so many people willing to help to get it done. I’ve often been disturbed by my own sense of pride at being part of this relief effort but I have come to the conclusion that pride in what we do to make a positive difference in our world is not a negative thing. It can be part of what drives us to act and suggest to others how they can be involved in solutions. 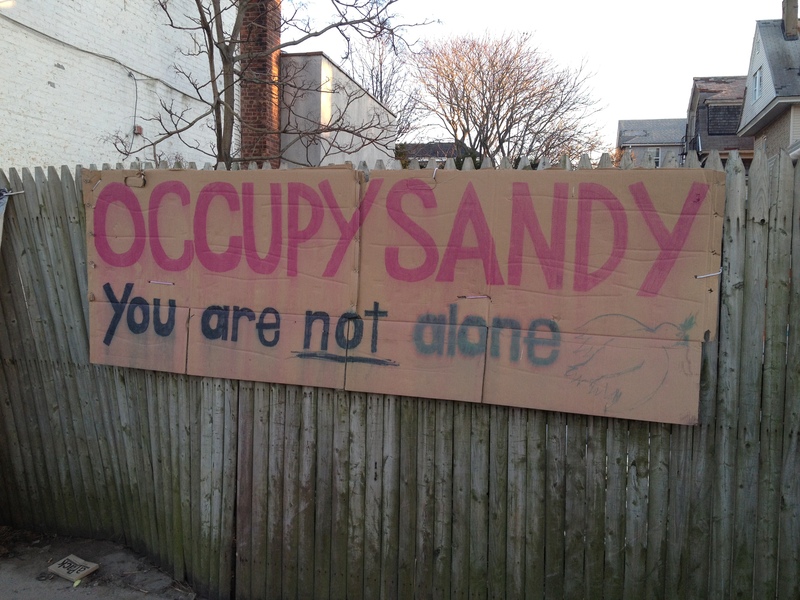 My pride is combined with gratitude for being able to contribute to something as positive as Occupy Sandy. This entry was posted in Uncategorized on November 25, 2012 by mcunha. It has been nearly three weeks since Hurricane/Superstorm Sandy hit the east coast. Thank all the gods and spirits that I live in an area which was not heavily damaged. There are some areas (like parts of Long Island) which are still without power, and a LOT of people still trying to clean up and figure out what to do next. Before I get into a little exchange I had before the storm, let me encourage all of you to continue to help the victims if you can. Give cash and don’t worry so much about getting stuff, because while money may seem unfeeling, charities are better able to put that to use than the hodge podge of what people send which may or may not be of value. Now, I spent the week leading up to the storm keeping my eyes on the weather and wondering what might happen here. I do admit to having an interest in preparedness for such disasters, even though in this case it was not as needed. The only utility which went out here was the cable. I managed without TV for a day, it was not that difficult. But oh, the storm. I was glad for the extra food I picked up and for knowing where candles and flashlights were located. Trees near my home were snapped or uprooted, large fans flying off buildings. My employer even closed for those two days. They NEVER close. I still feel thankful that they took the step because I imagine it kept a lot of people safer at home rather than trying to navigate the roads through that mess. And I did not have to worry about what I would eat should the power give out. Amid my preparations, I asked on social media for suggestions of what I should pick up in anticipation of the situation becoming very dire. Being in the traditional foods movement, I come across people who hold some very different beliefs from me. One person suggested that I go out and buy a shotgun. Never mind that I don’t have a lot of extra money these days, or could even likely get a gun that fast. Never mind that I do not know how to properly handle and shoot a gun. Never mind that I do live in suburbia and a relatively affluent area. This is New England. I know we have a reputation for all sorts of liberalism here, but there is also a certain old school conservatism. At least in the more urban areas. That’s not something we DO much around here. It seemed like an overkill suggestion. If the storm did not come on that strong and cause such an extreme level of damage I would have felt like I had wasted money. (Again, never mind the fact that I don’t WANT a gun in my house, unless I start to hunt on a regular basis.) But if the storm was so bad and left the area so ravaged that people were reduced to some kind of apocalyptic scenario, I would probably have a lot more to worry about than someone MAYBE coming to my door with some kind of demand. There are people out there who not only prepare for disaster on this level, but seem to be welcoming it, wanting it to come forth. On some deep level, I don’t understand that sort of wish. If the world were to unravel to that level, I’d rather be packing hospitality than heat. Does this seem like a strange stance for a polytheist? Someone who actively honors Gods from cultures where war was a regular part of life? Although I feel hard-pressed to think of any sort of culture on earth which has been exempt from this. But if you look further into the culture and lore of these societies, you will often find a high value placed on the virtue of hospitality. is going to be tested out. My two main traditions are Kemetic (Egyptian) and Heathen (Norse/Germanic). Both religions cam up from people living in harsh climates. One was a hot desert, the other a land dark and cold for half the year. Anyone who would have been traveling a far distance would have not had the easiest time on their journey. Settlements could be spread over miles and the only supplies would be the ones you carried. If something happened, like an injury or weather change, the traveler could die. Imagine the above stanzas being on the minds of a Scandinavian family who has heard a knock at their door during a snowy night after Midwinter. They open their door to find a man who has walked for days without seeing a single home, much less a full village. He is cold, frost handing from his beard, and his supplies are low. In that sort of environment, who would just go out for a stroll in those conditions and have nature beat down so hard on him? He might be a traveler, or yes, he might be a criminal. But it would not likely be in the family’s thinking to consider this person storming in to take over their settlement. I can imagine them getting before the fire, wrapped in a blanket, sharing some of their stew and home brewed ale to warm him. If he were somehow a criminal, I can’t imagine him wanting to rob or harm the people who had saved his skin. Yes, my spiritual and physical ancestors knew bloodshed. They also put a high value on times of peace, and on their communities. They needed those other people around and knew that together they could accomplish much more than with everyone working and focusing on their own little worlds. Life was rough, and they cherished the times when it was not because all too soon, those moments are gone. As modern pagans and polytheists, we would be wise to focus more on these aspects of our traditions rather than pugilism. With the climate going through major changes, storms like Sandy may well become more common. Who knows what kind of damage may come from them. Perhaps among our supplies stocked away for such storms, we should consider a good helping of compassion along with instruction in non-violent communication and conflict resolution. This entry was posted in Uncategorized and tagged charity, gun control, heathen, hospitality, Hurricane Sandy on November 18, 2012 by syncreticmystic. Being the Hero: How do we Move Forward? I think that I coped with my terror at the idea of Mitt Romney winning by thinking about what I’d write here…some kind of fire and thunder and call to action. And yet, in the wake of the election, I realize that that is still what we may might need. For many progressive folks, you may be excited that “your guy” won, and content to sit back for a bit. My guilty admission is that I voted out of a mixture of fear and hope. I knew a 3rd party candidate couldn’t win and feared that Romney would. I voted for President Obama because he was at least for some of the things I’m for. However–call me a blind optimist, but I believe in what the President said in his victory speech. Or more importantly, I believe that he believes…and that he wants to build a healthier, stronger, more tolerant nation. This entry was posted in Uncategorized on November 12, 2012 by shaunaaura. This is True the Vote’s depiction of voter fraud. I think their image of “fraud” is a trans person. There are two images nearby of a voter ID card with a female-appearing image and the name “Mary Jane James” and a masculine-appearing image with the name “John James.” I’m not sure whether those images are supposed to be related to this offensive cartoon or not. There are also images of two other people, both smiling, and my gut reaction is that they’re meant to be images of the “good guys” or “real voters.” The person-with-hair-in-a-dress is the only discordant image on the cover, and it’s the one accompanied by a slogan about fraud, while the other tag lines are all about “free and fair elections” and the like. True the Vote is not-so-subtly training its “election observers” to challenge trans people. Voter rights proponents have argued extensively that in-person voter fraud is basically non-existent, and in the legal challenge to the Pennsylvania voter ID law, proponents of the law agreed that the problem they claim to be trying to prevent is a non-issue. On the other hand, trans rights organizations have extensively documented harassment or problems resulting from inaccurate documentation and identification which does not accurately reflect a person’s gender. In this election season, with the glut of new laws about ID, tens of thousands of trans voters may be disenfranchised. Pagans tend to be more accepting of trans people than the average population. We’re far from perfect in this area, as recent controversies attest, but I would argue that we have a better track record than many groups. Those controversies and other situations have led to ongoing discussion in our community about these issues, discussion that often actively seeks out trans voices. We have religious reasons to understand gender a little differently – many, if not most, pantheons that we revere have deities or powers who are trans, gender-indeterminate, or gender-bending. As we continue those dialogues and, we need to continue that trend into the area of political activism to make sure that everyone – trans and cis alike – has an equal voice in our political process. With the election just days away, there’s not much we can do to change these laws – either the restrictive voter ID laws or the state-by-state patchwork of regulations that make it difficult for trans people to have accurate documentation. We can and should stay alert at the polls ourselves, as private citizens. If you see voter intimidation going on, make a note of it. You may not be able to stop it – don’t get yourself thrown out of the polling place, and don’t become the equally obstructive political inverse of interfering busybodies like True the Vote “monitors.” But you can tell people what you see. When this happens, we need to know about it, and we need to get the word out so that we can begin to change things for the next election cycle. Yes, we need to go vote. We need to stay aware of what’s going on in our voting process, too. And I think we need to cast our votes with an awareness of how those votes will shape the very ability of others to cast their own votes in the future. Will we elect officials who will continue to tighten requirements and foster an environment of intimidation? Or will we vote for officials who will try to make polling open and accessible to all people? This entry was posted in Uncategorized and tagged trans, voting on November 3, 2012 by Literata.